Hand-to-hand fighting deserves the proper Fingerless Gloves for amped up effectiveness. These are modeled after similar military models, the only difference you'll notice: these are brand new and offered for a sweet price. Fingerless design for top dexterity. Besides giving you the "upper hand" when it comes to special ops, these Fighters add convenience to your everyday life. 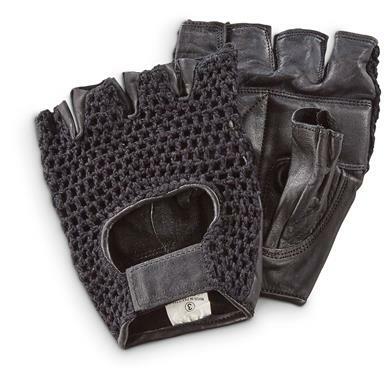 Keep your palms warm while making it easier to operate your motorcycle or ATV. Great for grabbing a smoke in chilly weather, too. Military Surplus Fingerless Fighting Gloves, New is rated 4.6 out of 5 by 8. Rated 5 out of 5 by Hoss 63 from Excellent Paired with the Glove inserts they make a very good shooting Glove by lowering recoil effect to the palm! Rated 5 out of 5 by Fitz from good buy very similar to older retro bicycling gloves that I wore out and are now harder to find.Quality good should work great for my bicycling. Rated 5 out of 5 by Franklin from Great bicycling gloves That what these are! Not fighting gloves, Why would you pad your palms to fight? Rated 5 out of 5 by Mk3StenMan from Good price, awful fit! For a 2XL size, I can barely get them on! Rated 5 out of 5 by smitty from great fit Great fit and pads my hands perfectly. Rated 3 out of 5 by Chuck from Good Price & Fit. I think there is too much filling in the Palm. Reduces movement. Rated 5 out of 5 by Noah from Great product, nice price. Bought a pair from these guys about 10 years ago, to ride my 2003 VTX1300S (Retro). Finally wore 'em out. A little vaseline keeps them right for years. Rated 4 out of 5 by Mack from Well made These gloves are all that I had hoped that they would be, they are well made and the large size fit my hands perfectly. I wear them to ride my motorcycle, it is a part of my ppe gear (personnel protective equipment).